Have you ever wondered what in the world to serve overnight guests for breakfast when people are waking up at different times, cycling through the bathroom, and coming to the table with a variety of likes and dislikes? Do you want to casually get some of your military spouse friends together but you don’t have time or extra cash during the holiday season to put together an elaborate spread? The solution is simple. 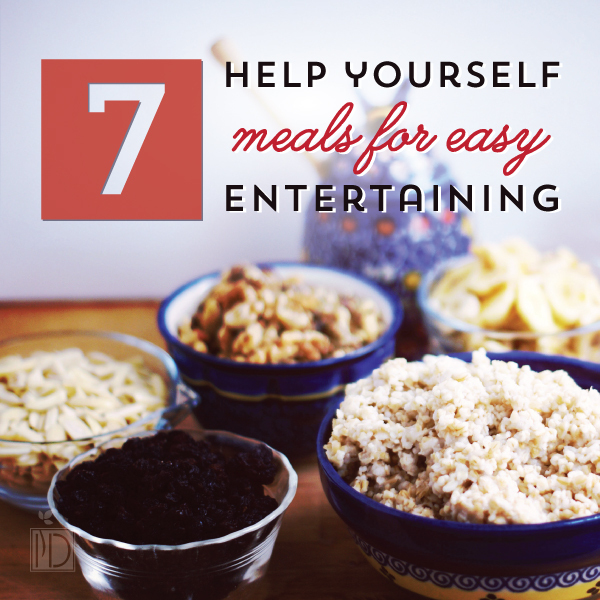 Put out a base food, a variety of toppings, and let guests help themselves. If friends or family want to contribute to the meal, you could offer the base food, and have everyone else bring toppings. Here are some ideas. Give them something hearty and warm that will stick with them through all of the fun activities you haveMy parents traveled 12 hours in the car with us after Thanksgiving. We didn’t have any fresh produce in the house the next morning because we had been on vacation. This was the perfect meal because I was able to use lots of my healthy pantry essentials that I keep on hand. Apples, pears, or clementine oranges would make nice fresh additions if you like. Base: Steel-cut oats. Slow cook them in a crockpot overnight. No crockpot? Try the quick soak method. Nuts – Almonds, pecans, walnuts, cashews, etc. Seeds – Sunflower seeds, flax seeds, chia seeds, etc. Dried fruit – Currants, raisins, bananas, apricots, etc. This is a nice, fresh option to offset all of the other rich holiday food. Base: For the biggest nutritional punch, choose something like red leaf lettuce, romaine, spinach, or even kale. Protein – Cottage cheese, hard-boiled eggs, lean meats, etc. Veggies – Carrots, cucumbers, peppers, broccoli, cauliflower, etc. Fruit – Pomegranate seeds, cranberries, raisins, etc. Seeds and nuts – Pumpkin seeds, sunflower seeds, pecans, etc. This is a great grab-and-go option for guests that need to run out the door in a hurry. Base: 100% whole grain bread. Confused about how to choose healthy bread? WebMD breaks it down. Spreads – Hummus, cream cheese, pesto, avocado, etc. Veggies – Lettuce, tomatoes, pickles, cucumbers, shredded carrots, peppers, etc. Protein – Lean meats, cheeses, vegetarian deli slices, etc. Everybody knows about loaded baked potatoes. But, have you tried the healthier sweet potato? It pairs really nicely with toppings you would usually find in Mexican food. This dish is a cross between nachos and a taco salad. It’s heavy on the greens like a salad but sits on a few tortilla chips or even quinoa rather than the big greasy shell. Base: Tortilla chips or quinoa if you want to really make a healthy choice. Chili is a wonderful comfort food that can really be a nutritious, filling meal if you load it with beans and veggies. Base: This Three-Bean Chili with Vegetables recipe feeds 16. The Friday after Thanksgiving, we made homemade pizzas for dinner. We started pre-made dough from Trader Joe’s (white, whole wheat, or garlic), sauce, and cheese, and then everyone got to choose their own toppings. The kids thought it was fun to design their own pizzas. I’ve included my favorite, easy pizza recipe below. 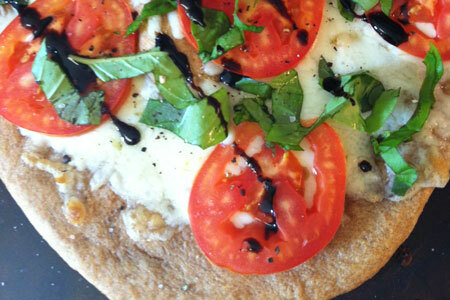 You can just use the crust as your base or introduce your guests to Bruschetta Pizza, which is unique and delicious. Keep it simple with the following, or go all out and offer many choices. Directions: Preheat the oven to 400 degrees F with the pizza stone inside. Mix the dough ingredients together and knead for 5 minutes. Let rest for 5 minutes. Meanwhile, mix together the olive oil and garlic. Roll out the dough and carefully place on the preheated pizza stone. Brush the olive oil mixture on top of the pizza. Bake 5-7 minutes or until crispy. Take out of the oven and add cheese and tomatoes. Bake 5 more minutes or until golden brown. Remove from oven and sprinkle with basil, salt, and fresh ground pepper. Drizzle with balsamic vinegar.